I first started working out regularly back in 2003. Personal fitness quickly became a bit of an obsession, and I was soon in the gym 6-7 days a week for 2-4 hours at a time. Though most of us start working out with a goal in mind (losing 20lbs or bench pressing 250lbs), I eventually learned that they’re not the best approach to fitness for a lifetime. 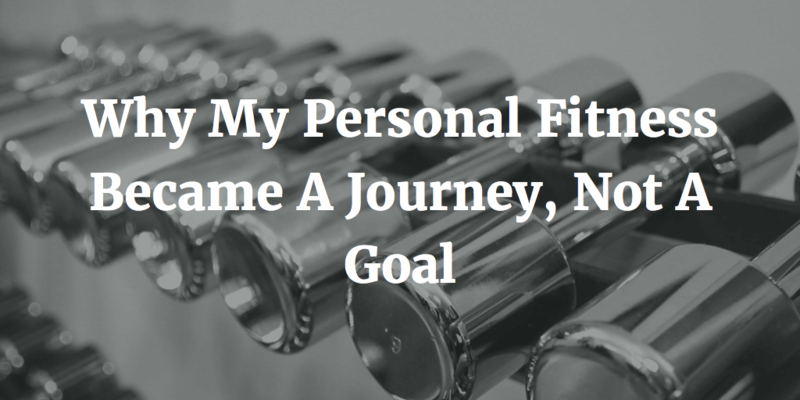 Here’s why my personal fitness has become a journey, rather than a goal. For most, the start of an exercise and fitness program is when we see the quickest results. The initial weight loss is generally water weight, rather than fat loss. Weight lifting abilities increase as it’s simple to build a little muscle where nearly nothing existed before. I was setting goals and achieving them almost every week. 5lbs more to my bench each Monday was a goal I made and achieved every single week as I climbed from 145lbs to 215lbs. It seemed like I could just keep going up and up. But then, like almost everyone, I hit a wall. This is the point where most give up (if they even make it that far). While it was discouraging to be unable to meet my next goal, the truth is it’s impossible to continue such gains indefinitely. Unless we see realize, we may let our failures stop us from achieving what we want from our personal fitness. This was when I realized that goals weren’t the best approach to fitness. Seeing it as a journey will far better serve most. Goals by their definition have an end objective. We set goals and then do A, B, and C required to achieve that goal. But what happens when we get there? In the best cases, we set another goal and then use the same approach we used to achieve the first, to then work towards the next. Once we get there, we repeat the process all over again. But how often does that happen? And while it may be great to achieve a goal, we don’t spend most of our time in the achieved zone. Instead, most of our time is spent struggling to get to where we want to be. Until we’re there (which could be days, weeks, months, or even years away) there are all kinds of problems that can crush our confidence and drive. This leads many to abandon their goals. There’s a reason 80% of health club memberships started in January are abandoned within 5 months. To put it bluntly, goals are for losers. That’s literally true most of the time. For example, if your goal is to lose ten pounds, you will spend every moment until you reach the goal—if you reach it at all—feeling as if you were short of your goal. In other words, goal-oriented people exist in a state of nearly continuous failure that they hope will be temporary. That feeling wears on you. In time, it becomes heavy and uncomfrotable. It might even drive you out of the game. Goals might sound like a good idea, but they can quickly become discouraging. Fitness shouldn’t be about getting to a single place and stopping. Or taking multiple stops along the way. It should be about a continued journey in a direction of betterment. And that’s why I made the switch. Journeys have many advantages to simple goals. The only real rule is that you need to continue to strive in the general direction of desire. While it may have some twists and turns we don’t expect (weeks we’re sick, injuries, and other unexpected), we never fail because we don’t have anywhere we must be at that point. Every bit is part of the journey. Without the negative pitfalls and failures that goals bring, journeys are far easier to stick to. That doesn’t mean they don’t produce equality awesome results, but they also don’t cause us to pause or stop, as we often do when we meet our goals. My journey means I’ll continue to workout 5-7 days a week. I still burn the calories I want to kill and lift the weights I want to move, but I don’t get down when I don’t hit some silly number that can derail my determination. By making the switch in mindset, I’ve continued to remain fit, while keeping myself from failing. I’ve never failed once in achieving what I want since the switch. I may not be happy when I can’t make it to the gym, but it doesn’t get me down because I know I’ll continue right where I left off when I return. The results are still great and I’m now happier with where I am. Making a switch made a big impact on my ability to keep myself in the gym and doing good work day after day for more than 13 years now. The mindset change that came with the switch from personal fitness goals to making personal fitness a journey, allowed me to avoid failure and see bigger wins than I likely would have if I’d kept with the traditional goal-based strategy. Consider the objective of your own fitness. If you’re looking to simply get to a single place, a goal may fit the bill. But if you’re looking to make fitness a life-long part of yourself, a journey may be a better strategy to explore.